Using Biber’s (1988) multidimensional analysis, this study investigates textual variation in second language (L2) learners’ writing at different proficiency levels, and attempts to identify any developmental progression. 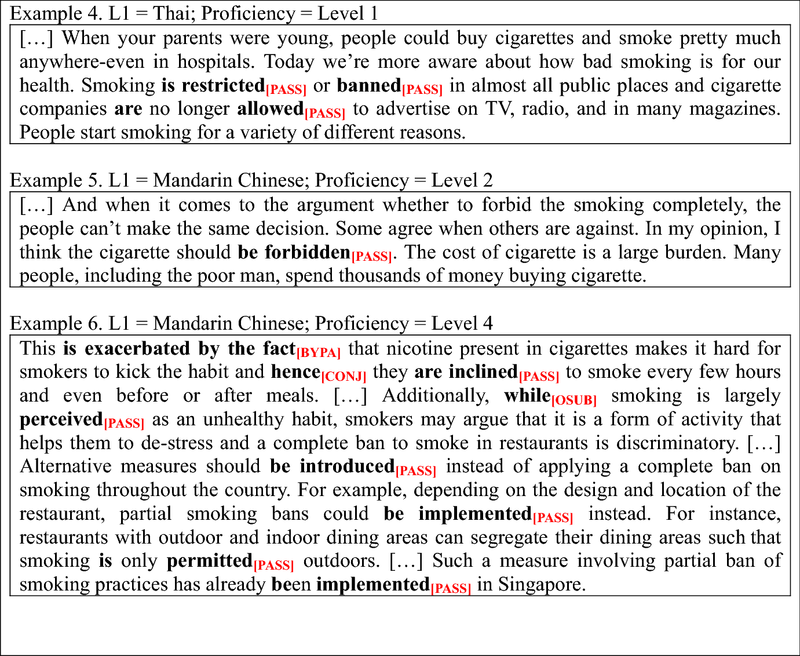 The study used a corpus of 5200 argumentative essays written by 2600 students learning English as an L2. The results indicate that advanced L2 writing is fundamentally different from less advanced L2 writing: Advanced learners’ writing is closer to native speakers’ written discourse, while less advanced learners’ writing is closer to native speakers’ spoken discourse. The patterns of development vary across different sets of textual features. Informational (as opposed to involved) production and impersonal (as opposed to nonimpersonal) style showed gradual development as the learners’ proficiency increases. Nonnarrative (as opposed to narrative) production, elaborated (as opposed to situation-dependent) reference, and overt expression of persuasion did not show significant differences across the proficiency levels. 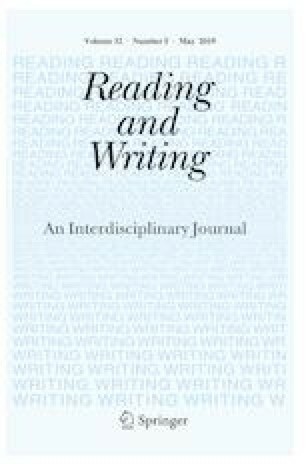 The article offers pedagogical implications for practices of L2 writing instruction. This work was supported by the Ministry of Education of the Republic of Korea and the National Research Foundation of Korea (NRF-2016S1A5A2A03926788). Note. 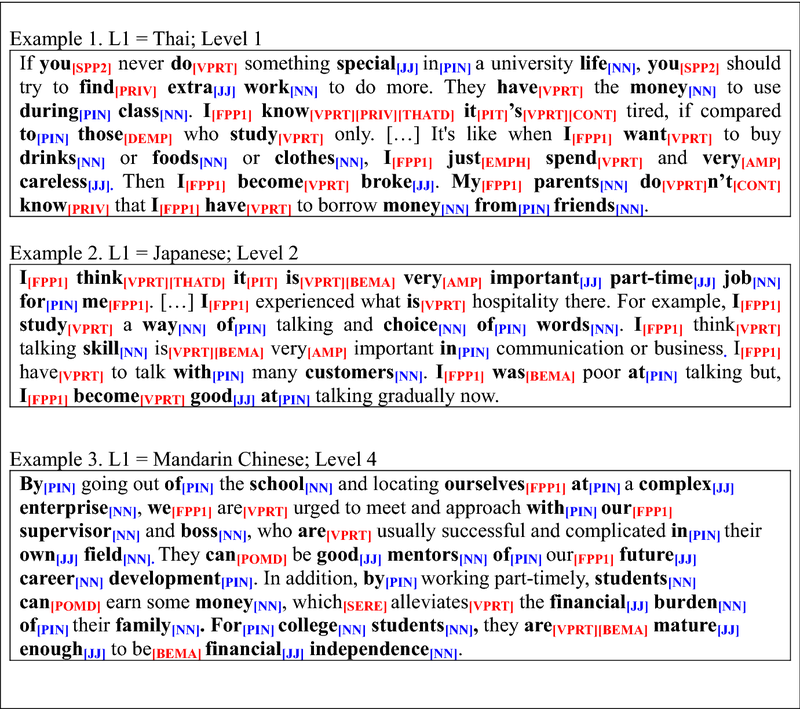 Positive features are highlighted in red; negative features are highlighted in blue; [AMP], amplifier; [BEMA], be as main verb; [CONT], contraction; [FPP1], first-person pronoun; [JJ], attributive adjective; [NN], noun; [PIN], preposition; [PIT], pronoun it; [POMD], possibility modal; [PRIV], private verb; [SPP2], second-person pronoun; [VPRT], present tense; [THATD], subordinator that-deletion; [VPRT], present tense. Note. Positive features are highlighted in red; [BYPA], by-passive; [CONJ], conjunct; [OSUB], other adverbial subordinator; [PASS], agentless passive. Note. 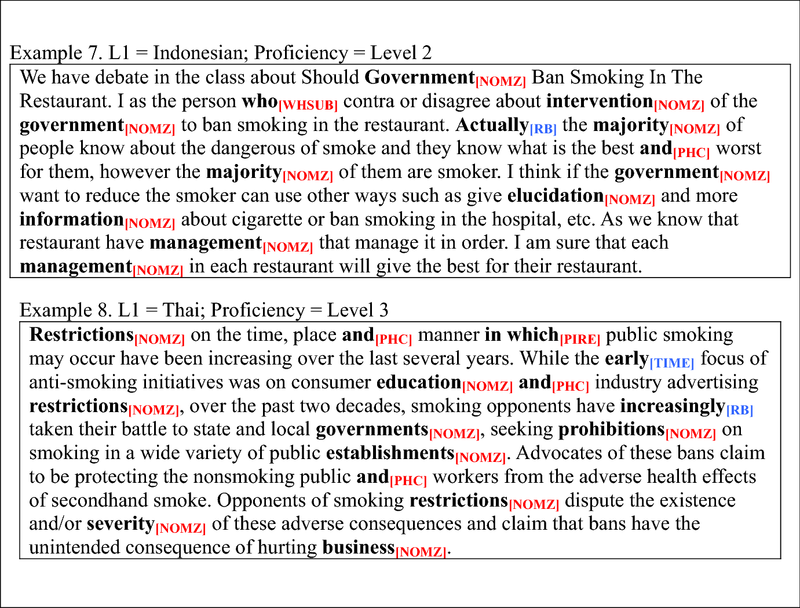 Positive features are highlighted in red; negative features are highlighted in blue; [NOMZ], nominalization; [PHC], phrasal coordination; [PIRE], pied-piping relative clause; [TIME], time adverbial; [RB], total adverb; [WHSUB]; wh-relative clause on subject position. Note. 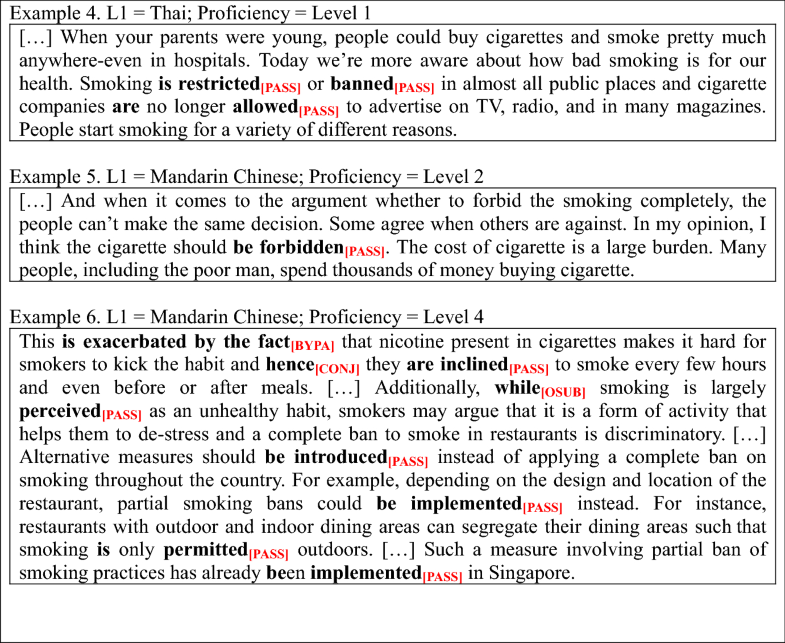 Positive features are highlighted in red; [COND], conditional adverbial subordinator; [POMD], possibility modal; [PRMD], predictive modal; [SPAU], split auxiliary; [SUAV], suasive verb; [TOOO], infinitive. Grace-Martin, K. (2019). Specifying fixed and random factors in mixed models. Retrieved from https://www.theanalysisfactor.com/specifying-fixed-and-random-factors-in-mixed-models/. Accessed 27 Mar 2019. Ishikawa, S. (2019). 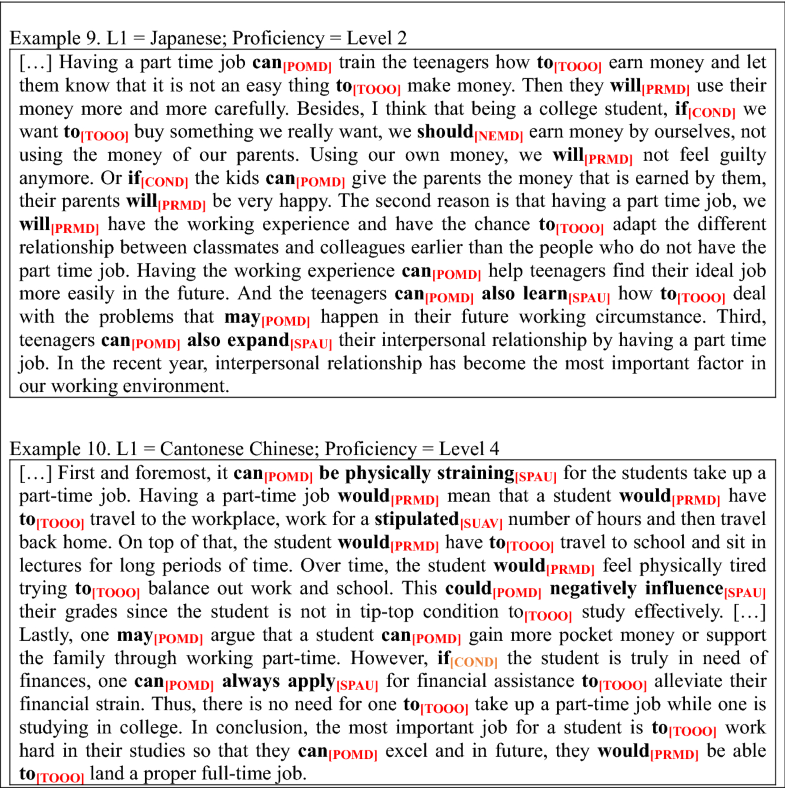 The ICNALE: The international corpus network of Asian learners of English. Retrieved from http://language.sakura.ne.jp/icnale/. Accessed 27 Mar 2019. Nini, A. (2015). Multidimensional analysis tagger (version 1.3). Retrieved from http://sites.google.com/site/multidimensionaltagger. Accessed 27 Mar 2019. Winter, B. (2013). A very basic tutorial for performing linear mixed effects analyses (Tutorial 2). Retrieved from www.bodowinter.com/tutorial/bw_LME_tutorial2.pdf. Accessed 27 Mar 2019.